Note the chlorotic (yellowish) areas, as well as distortion and upward curling of the leaf margins. Field shot of ApMV-infected hop plant. Note the yellow arcs and rings. Another ApMV-infected hop plant. Note the yellowish-brownish arcs and rings. Cause Hop latent virus (HpLV), American hop latent virus (AHLV), Hop mosaic virus (HpMV), and Apple mosaic virus (ApMV) been found in Pacific Northwest hop yards. The first two produce no symptoms and no known crop loss. HpMV, a carlavirus, has not been a problem traditionally even when detected in a planting. Many cultivars are tolerant to HpMV and are asymptomatic when infected; a few like Chinook and Golding can be very sensitive. 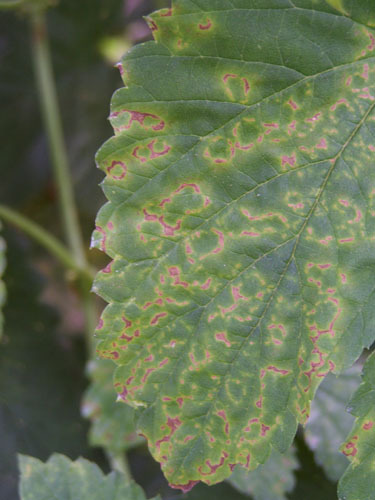 ApMV, an ilarvirus previously known in hop as Prunus necrotic ringspot virus, can cause up to 30% loss in cone production and also decrease alpha acid levels, but ApMV effects are cultivar dependent. HpLV, AHLV, and HpMV are transmitted by plant-to-plant contact and by the Damson-hop aphid (Phorodon humuli); HpMV also transmitted by the green-peach aphid, Myzus persicae. ApMV moves by plant-to-plant contact. Symptoms HpLV- and AHLV-infected plants have no known symptoms on varieties grown in the Pacific Northwest. HpMV-sensitive hops show a chlorotic, pale vein-banding on the leaf, which is mottled and curls down strongly. Diseased hills may survive several years but are stunted with shortened internodes and can be killed by the infection. 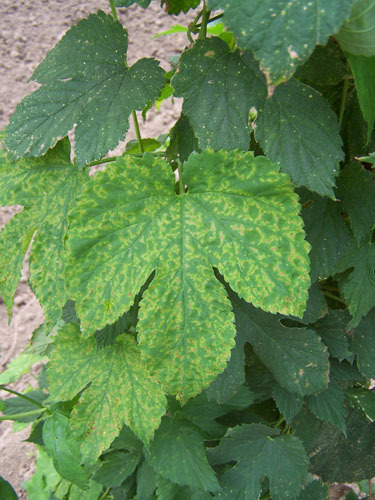 ApMV-symptoms depend on hop variety and virus strain, and especially rapid changes in weather. Symptoms usually are suppressed in hot weather and appear during cool weather. Consequently, symptoms may occur in leaves of a certain age but not in younger or older leaves. This is true of other plant parts as well. Foliar symptoms include chlorotic or necrotic arcs and rings or necrotic line patterns. Leaves often have a crisp and leathery texture as well and there may be curling of the leaf margins. Plants usually are stunted with shortened internodes and sidearms and may have difficulty climbing. If cool weather occurs during flowering, cone set and size may be drastically reduced. Cultural control Exclusion is an important means of virus control. Use virus-tested stock certified to be free of viruses. Plant where hops have not been grown before or in fields where all hop plants have died out. General sanitation for disease control. Clean equipment between yards, particularly during early season operations. Currently, it is recommended that equipment be cleaned by first washing to remove plant debris and then with a 5% to 10% bleach solution for at least a few seconds to upwards of 10 minutes. The longer time the equipment can be in contact with the disinfecting solution, the greater the likelihood that the equipment will be sanitized. Because the bleach is so caustic to metals, it may be good idea to rinse equipment with clean water after sanitizing. Destroy plants that are severely stunted or yellowed. Eastwell, K.C., and Nelson, M.E. 2007. 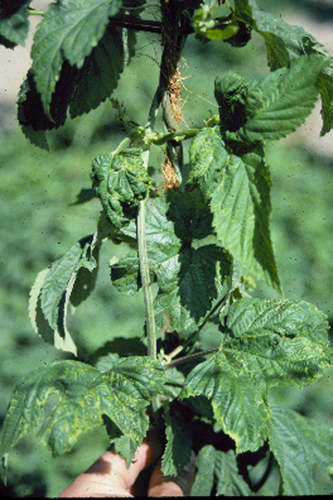 Occurrence of viroids in commercial hop (Humulus lupulus L.) production areas of Wash-ington State. Plant Health Progress doi:10.1094/PHP-2007-1127-01-RS. Pethybridge, S.J., et al. 2008. Viruses and viroids infecting hop: significance, epidemiology, and management. Plant Disease 92(3):324-338.